The name of No Bonus Casino may sound like a terrible way to market a casino site, but this is not necessarily true. No Bonus Casino is quite possibly the only online casino that you will find that will never offer you a bonus, this is because they avoid what they describe as ‘bad bonuses’. Instead of bonuses, No Bonus Casino claims to focus on customer service and cashback offers, including 10% cashback on every deposit at the time of writing, for its players, avoiding the terms and conditions and wagering requirements that the majority of casino bonuses come attached to. No Bonus Casino has a simple general concept, and its design backs this up. There are no bells and whistles here, but at the same time the design theme is far from boring. Pink, purple, and white are your main colours here, with a dark purple playing the most predominant role, which allows for a lot of colour without being too offensive on the eyes. Navigation here is simple, many games are available from the homepage, and you’ll find any information you require without difficulty. 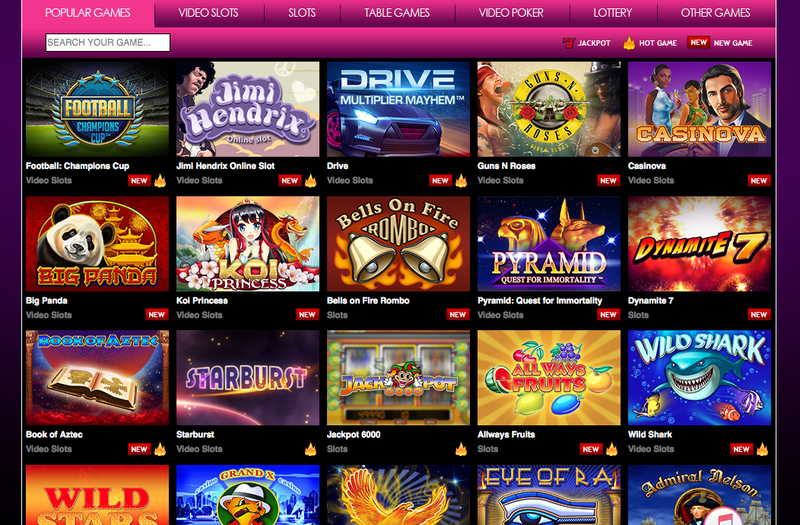 No Bonus Casino has a fairly unique collection of games on offer, with a rare combination of software providers, namely Amatic Industries, NetEnt, Portomaso Gaming, and Yggdrasil. This means that you will get a combination of well-known games, both new releases and old favourites (including Starburst, Jack and the Beanstalk, Gonzo’s Quest, TwinSpin, Football: Champions Cup, and more) as well as an abundance of lesser known games for you to discover along the way! The no bonus concept here is definitely interesting, and should spark the interest of those who are unimpressed by the amount of small print on many promotions. Once you have been enticed in, you are unlikely to regret your choice, this is a very good site.